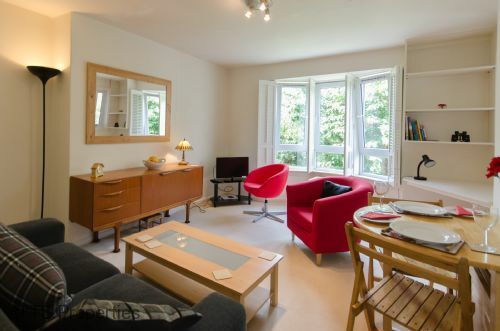 The owners of 15 Baker Lane in St Andrews, Fife have owned the charming self contained flat for over 4 years, but have only recently put it out to holiday let. The property is sure to be a hit as it is situated on a quiet, sunny street only minutes away from the centre of town. This sense of quiet, and the excellent location, are the primary reasons that the owners bought 15 Baker Lane in the first place. They enjoy the fact that the property is not overlooked by any other houses and looks out onto beautiful gardens front and back. This makes it perfect for those who enjoy relaxing in comfort, but also for those who like to be close to the centre of the action. St Andrews is a stunning historic town located on the coast that is a curious mix of old Scottish charm and modern activities and attractions. Old and new mix everywhere in St Andrews, the old cathedral and castle stand side by side with the modern buildings of the ancient university, and the old winding streets contain a myriad of contemporary gift shops that will delight even the most picky of shoppers. The town is home to a wide variety of fantastic restaurants, from the obvious quality choices such as The Old Course, The Fairmont and The Seafood restaurant, to little known gems such as Little Italy and The Vineleaf, which are both tucked away in hidden corners and guarded jealously by those who love them. There are two gorgeous stretches of beach that are easily accessible from 15 Baker Lane, and which offer unrivaled views of the sea and of nature at her finest. Of course, St Andrews cannot be mentioned without saying golf in the same sentence. The home of the ancient sport, St Andrews and the surrounding area is full of challenging courses that will provide much enjoyment for beginners and seasoned veterans of the sport. The timeless atmosphere of the town is infectious, and this charming place keeps guests returning again and again. There is really nowhere more gorgeous on a summers day; have an ice cream at the famous Janettas, stroll past the ruined cathedral down to East Sands to watch the sea, and then end up with drinks and dinner at one of the variety of bars. 15 Baker Lane is also a great base for exploring wider areas of Fife. It is only 15 minutes away from the pretty fishing villages of the East Neuk, which include Anstuther, home of the best fish and chips in Scotland, and Crail, home of the most gorgeous fishing harbor. The scenery on the way to these places is more than worth the drive in itself. Also, transport links from St Andrews are excellent, ensuring that you can be in any of the major cities in around an hour. The owners of 15 Baker Lane have only been with TS Properties for a few months, but are already seeing the benefits of working with a management organization. Like many of the other owners who use TS Properties, the owners do not live near to the property to ensure the proper day to day management necessary with holiday lets. TS Properties management package allows owners peace of mind in knowing that all the details of booking and advertising are cared for by the organization, as well as any issues that might arise. They also highlight the usefulness of the wide advertising reach of the organization. TS Properties is linked with a number of online sites which are popular with travellers, and are therefore well positioned to ensure maximum coverage for properties.